Leatherdos have released a hair clip that not only keeps your hair out of your face, it's practically a swiss army knife do-it-all gadget. 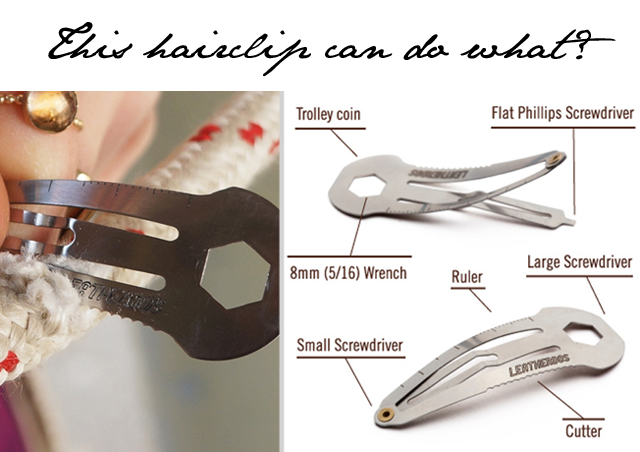 The hair clip can act as a screwdriver, a ruler, a wrench and a cutter. No joke, people, this is happening. The hair clips carry a price tag of $9.99 and have already sold out. Apparently there are more coming in for October, so delay any activity requiring such a cool invention until that date. Happy hair clipping.